80% of men survive NHL (all subtypes combined) for at least one year, and this is predicted to fall to 68% surviving for five years or more, as shown by age-standardised net survival for patients diagnosed with NHL during 2010-2011 in England and Wales. 79% of women survive NHL for one year or more, and 70% are predicted to survive for at least five years. NHL survival continues to fall beyond five years after diagnosis. 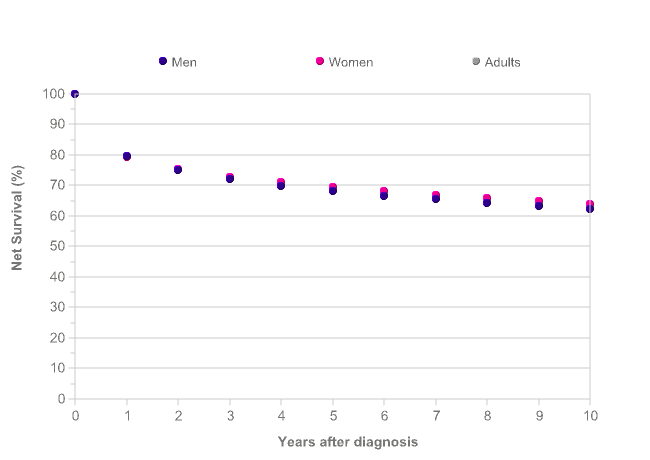 62% of men and 64% of women are predicted to survive their disease for ten years or more, as shown by age-standardised net survival for patients diagnosed with NHL during 2010-2011 in England and Wales. Out of 20 common cancers in England and Wales, ten-year survival for NHL ranks 7th highest overall. Survival for NHL is reported in Scotland and Northern Ireland,[2,3] though it is difficult to make survival comparisons between countries due to different methodologies and criteria for including patients in analyses. 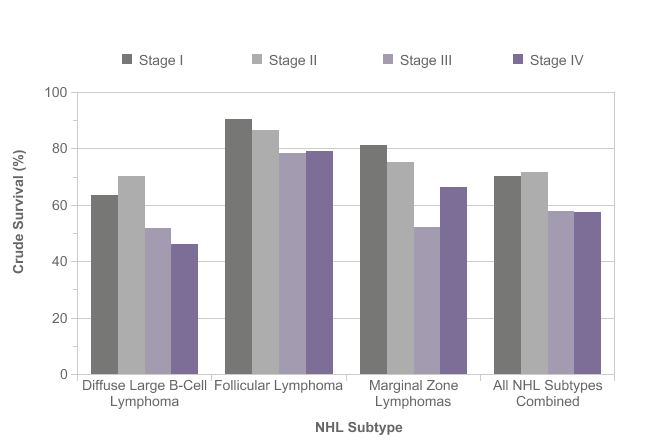 Survival varies considerably by NHL subtype. One-year relative survival is significantly better for follicular lymphoma (96%) than for diffuse large B-cell lymphoma (65%), mantle cell lymphoma (71%) or marginal zone lymphoma (92%) for patients diagnosed during 2004-2011 in the Haematological Malignancy Research Network (HMRN) region. Five-year survival follows a similar pattern and is significantly higher for follicular lymphoma (87%) and significantly lower for mantle cell lymphoma (27%) in comparison with the two other main NHL subtypes. 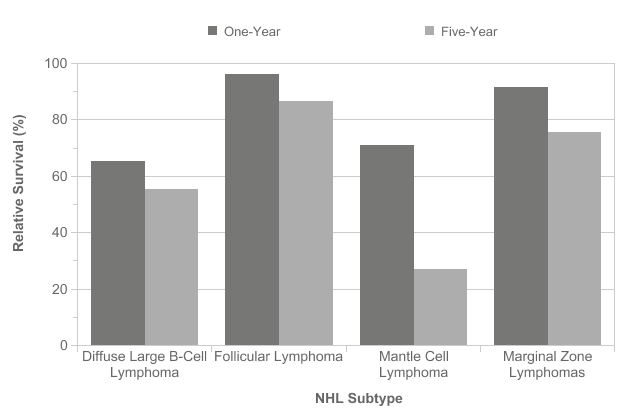 Mantle cell lymphoma, which is an aggressive NHL subtype, shows the largest decrease in survival between one and five years after diagnosis. In this section, survival by subtype is provided for the HMRN region in the north-east of England. Data were provided by Haematological Malignancy Research Network (HMRN) on request, 2013. Data is for: England and Wales (2010-2011), ICD-10 C82-85. HMRN (2004-2011), main subtypes. NHL statistics by subtype are provided for the Haematological Malignancy Research Network (HMRN) region. HMRN covers a population of 3.6 million and is set within the former adjacent UK Cancer Networks of Yorkshire and the Humber & Yorkshire Coast England. While HMRN may not be fully representative of the country as a whole due to variation in local healthcare provision standards and policies, the population does have a similar socio-demographic profile to the UK. Five-year survival for NHL (all subtypes combined) decreases with increasing age. 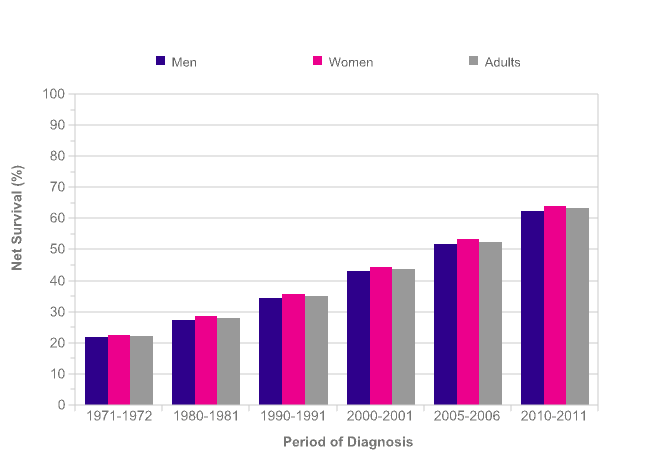 Five-year net survival in men ranges from 84% in 15-39 year-olds to 43% in 80-99 year-olds for patients diagnosed with NHL in England during 2009-2013. 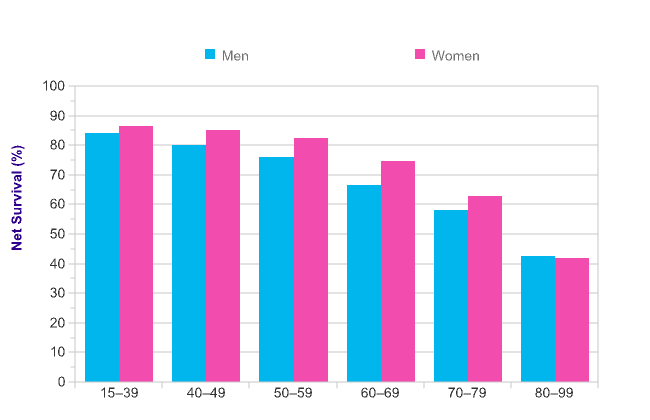 In women, five-year survival ranges from 86% to 42% in the same age groups. Office for National Statistics. 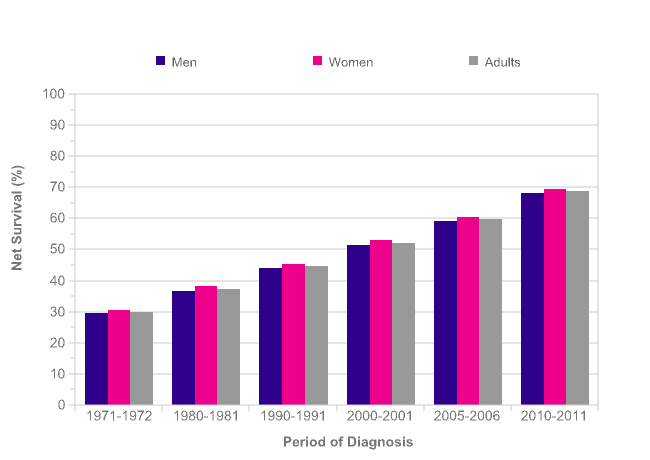 Cancer survival in England: adults diagnosed in 2009 to 2013 , followed up to 2014. Newport: ONS; 2015. Haematological Malignancy Research Network (HMRN). Personal communication, 2013. As with most cancers, survival for NHL (all subtypes combined) is improving. Some of the increase is likely to be attributable to changes in the diagnosis, classification and registration of NHL, so interpretation of these trends should be undertaken with caution. One-year age-standardised net survival for NHL in men has increased from 49% during 1971-1972 to 80% during 2010-2011 in England and Wales – an absolute survival difference of 30 percentage points. In women, one-year survival has increased from 50% to 79% over the same time period (a difference of 30 percentage points). Five- and ten-year survival has increased by an even greater amount than one-year survival since the early 1970s. Five-year age-standardised net survival for NHL in men has increased from 30% during 1971-1972 to a predicted survival of 68% during 2010-2011 in England and Wales – an absolute survival difference of 39 percentage points. In women, five-year survival has increased from 31% to 70% over the same time period (a difference of 39 percentage points). Ten-year age-standardised net survival for NHL in men has increased from 22% during 1971-1972 to a predicted survival of 62% during 2010-2011 in England and Wales – an absolute survival difference of 41 percentage points. In women, ten-year survival has increased from 22% to 64% over the same time period (a difference of 42 percentage points). Overall, more than 6 in 10 people diagnosed with NHL today are predicted to survive their disease for at least ten years. Patients who are diagnosed with NHL at an early stage have a much better prognosis than those who present with more extensive disease. Haematological Malignancy Research Network (HMRN) data indicate that 70% of patients diagnosed at Stage I are alive five years after diagnosis, compared with 58% of patients with advanced disease (Stage IV). The impact of stage at diagnosis on five-year survival rates varies by subtype: for follicular lymphoma (FL), diagnosis at Stage I and Stage IV confers survival rates of 91% and 79%, respectively; for diffuse large B-cell lymphoma (DLBCL) the survival difference by stage is more marked, with Stage I and Stage IV survival rates of 63% and 46%, respectively. Data were provided by Haematological Malignancy Research Network (HMRN) on request. The most recent England-wide data for 2004-2006 showed NHL (all subtypes combined) three-year survival rates for men were significantly lower in the most deprived areas than in the most affluent (60% versus 65%). For women, the deprivation gap was not significant (61% versus 68%). However, a similar study from Scotland for 1996-2000 did not find any significant differences in survival by deprivation. Rates of emergency presentation with NHL were significantly higher in the most deprived areas than in the most affluent, a study of patients in England in 2006-2008 found; however a previous study found socio-economic status did not appear to be associated with delays in NHL diagnosis. Rachet B, Ellis L, Maringe C, et al. Socioeconomic inequalities in cancer survival in England after the NHS cancer plan. Brit J Cancer 2010;103:446-53. Shack LG, Rachet B, Brewster DH, et al. 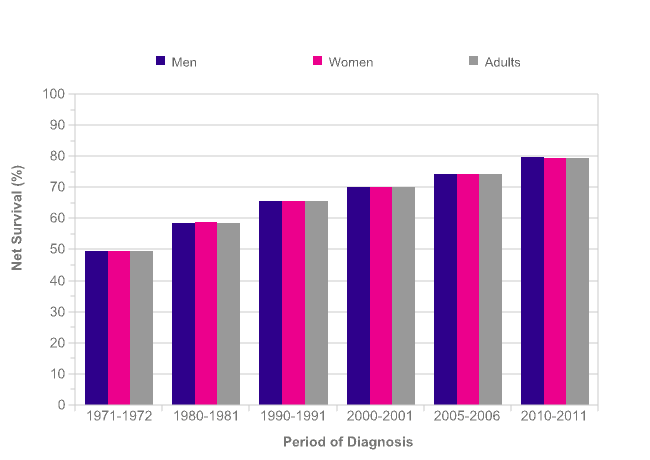 Socioeconomic inequalities in cancer survival in Scotland 1986-2000. Brit J Cancer 2007;97:999-1004. National Cancer Intelligence Network. Routes to Diagnosis, 2006-2008: NCIN information supplement. London: NCIN; 2012. Neal RD, Allgar VL. Sociodemographic factors and delays in the diagnosis of six cancers: analysis of data from the "National Survey of NHS Patients: Cancer". Brit J Cancer 2005;92:1971-5. Five-year relative survival for non-Hodgkin lymphoma in men in England (55%) and Northern Ireland (55%) are below the average for Europe (57%). Wales (54%) is also below the European average but Scotland (58%) is similar to the European average. Across the European countries for which data is available, five-year relative survival in men ranges from 33% (Bulgaria) to 69% (Iceland). Five-year relative survival for non-Hodgkin lymphoma in women in England (59%) is below the average for Europe (62%). Wales (60%), Scotland (62%) and Northern Ireland (64%) are similar to the European average. 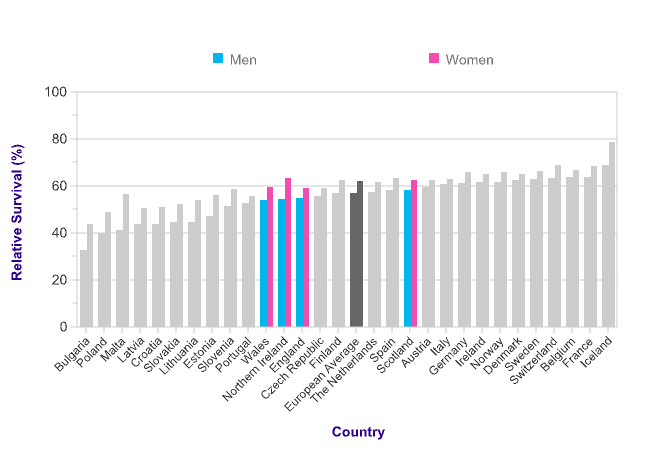 Across the European countries for which data is available, five-year relative survival in women ranges from 44% (Bulgaria) to 79% (Iceland). Data is for: 29 European countries, patients diagnosed in 2000-2007 and followed up to 2008, non-Hodgkin lymphoma (C82-C85).